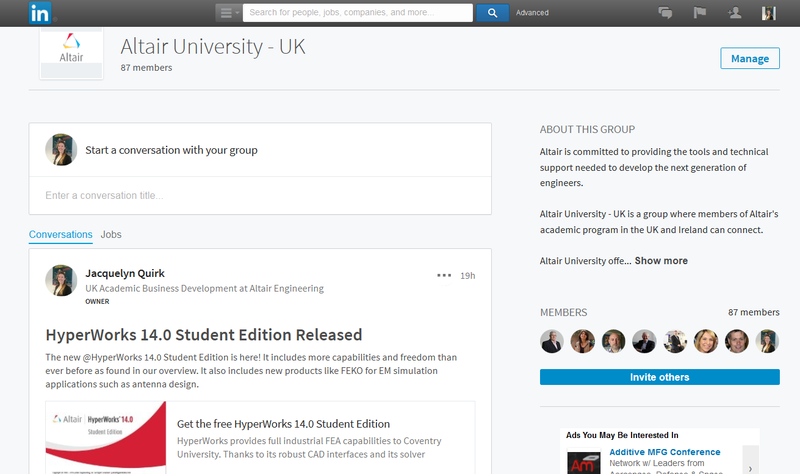 UK professors, lecturers, researchers, and students are invited to stay up-to-date with local academic news and contribute stories on the new LinkedIn group. Be sure to also follow the academic program on twitter @altair_edu and @altair_UK or on the Altair University global Facebook page. Altair is committed to providing the tools and technical support needed to develop the next generation of engineers. Altair University – UK is a group where members of Altair’s academic program in the UK and Ireland can connect. Altair University offers students, teachers, and researchers around the world the opportunity to access HyperWorks technology and to learn simulation techniques used by engineering companies around the world.